In Antarctica, relentless winds have created a unique type of snowdrift pattern known as megadunes. Formed by centuries of nearly continuous winds, megadunes are 1 to 8 meters high (1 meter is 3.3 feet), and 2 to 6 kilometers from crest to crest. 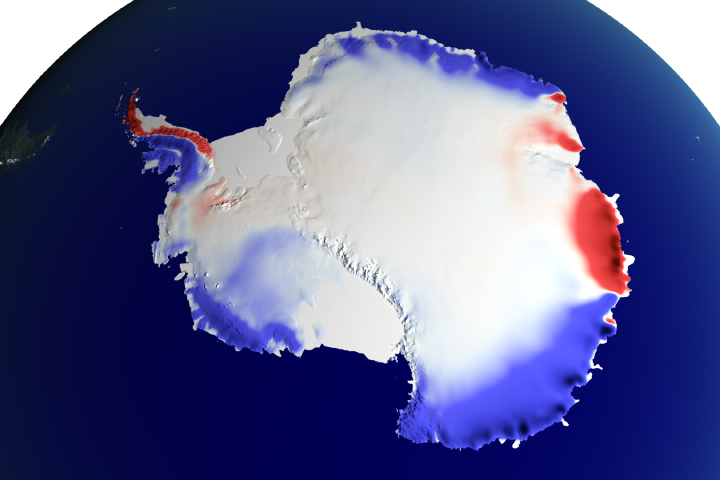 They cover roughly 500,000 square kilometersa California-sized area—in the East Antarctic Plateau. People making ground traverses across the Antarctic Plateau in the 1950s and 1960s passed over several megadune areas, but because the dunes are so much wider than they are high, trekkers didn’t notice the unusual terrain underfoot. Pilots flying over the continent saw small portions of the megadune areas, but only satellite imagery fully revealed the scale of these bizarre formations. Megadunes ripple horizontally across these satellite images. Perpendicular to the megadunes is a corduroy-like pattern, most visible in the bottom satellite image. 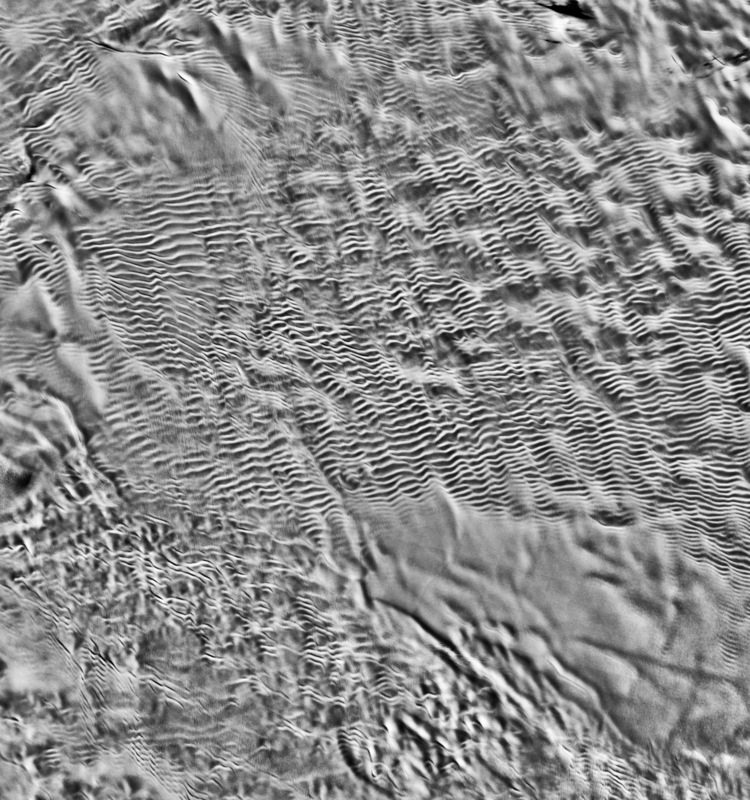 This pattern is created by linear sets of sastrugi, ubiquitous snow sculptures like frozen waves on the ocean. Among the megadunes, sastrugi assume huge, meter-high forms that, up close, can resemble leaping dolphins; the crests of the megadunes can also sport beast-like sastrugi. This image of Antarctica provides a look at megadunes and sastrugi that didn’t require frostbite danger or duct tape. It uses a new approach of “stacking” satellite images from NASA’s Moderate Resolution Imaging Spectroradiometer (MODIS). By overlaying several MODIS images, researchers can achieve a resolution far better than the single input images. Here, six 250-meter-resolution MODIS images are stacked and filtered to yield an image with approximately 100-meter resolution. This satellite image uses the same technology as the forthcoming Mosaic of Antarctica, a continent-wide MODIS image map that the National Snow and Ice Data Center and the University of New Hampshire will release in the fall of 2005. 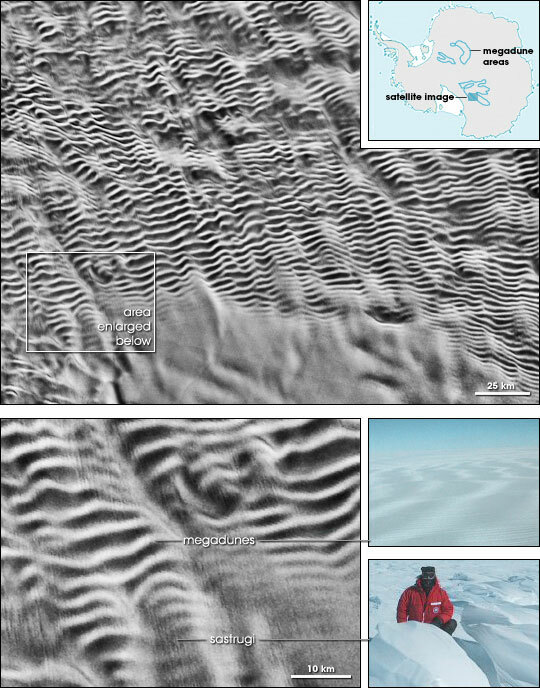 Fahnestock, M.A., Scambos, T.A., Shuman, C.A., Arthern, R.J., Winebrenner, D.P., and Kwok, R. (2000) Snow megadune fields on the East Antarctic Plateau: extreme atmosphere-ice interaction. Geophysical Research Letters, 27(22), 3719-3722. Scambos, T.A., Kvaran, G., and Fahnestock, M.A. (1999) Improving AVHRR resolution through data cumulation for mapping polar ice sheets. Remote Sensing of Environment, 69, 56-66.